Heat oven to 375°F. In large bowl, mix cookie mix, butter and egg with spoon until soft dough forms. Shape into 36 (1 1/4-inch) balls (about 1 tablespoon each); place in ungreased mini muffin cups. Press indentation in centre of each with end of wooden spoon. Bake 8 to 10 minutes or until light golden brown around edges. 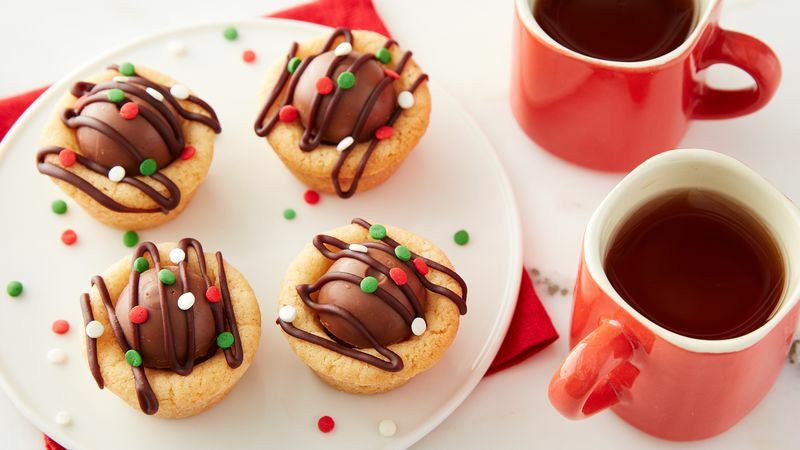 Immediately repeat indentation into centre of each cookie with end of wooden spoon to create 1-inch opening, cleaning off end with paper towel when needed. Cool in pan 15 minutes. Remove to cooling rack; cool completely. Try dark or white truffles instead of milk chocolate for a new flavour combination.